Courtesy of IMDb and a dedicated plot summary writer. Yes, the movie seems batshit in its own right, but you really have to appreciate that the writer decided that the best possible way to summarize this film was to include his own critiques and asides. Also, I have no clue what last-act plot twist is being described in the final two sentences — nor why the he felt it necessary to give away the last act in what should ideally be a three-sentence tease. Got problems? Need a shrink? Call an alcoholic reporter instead. Janet Ames is a war widow who deeply resents the five buddies of her husband, whom he died to save, although she only knows their names. She is approaching a cafe where the first of the five men, whose names are on a list in her hand, is employed. Her plan, whatever it was, becomes somewhat secondary when she is ran over by a truck and is taken to the hospital unconsciousness. There, in one fell swoop of an amazing coincidence, she is identified by Smithfield Cobb, a reporter addicted to drink — probably because of his name — who also happens to be the fifth man on her list. She regains consciousness but is unable to walk, although the best medical minds in the building say she has no personal injury that prevents her from walking. Smithfield sees right off that her problem is mental, and he decides he will cure her by using psycho-analysis and suggestion — the man came equipped — to wipe away her perception that the five men whose lives her husband saved at the cost of his own were not worthy of the sacrifice. He describes to her each of the other four men and makes them all seem to be worthy and successful men and prime candidates for induction into the Jaycees. He lies of course, but all in a good cause. He gets around to himself and tells her he is quite a distinguished journalist — with a capital J — and the next thing anyone knows, Janet is dancing around the room and fully cured of her boiled-up resentment, or whatever. But, wait... It isn't over. Smithfield is ashamed of telling her all these lies, and he flees for the nearest bar and is working on becoming a complete basket-case. Janet follows and she then proceeds to overcome by psychoanalysis and suggestion — can't overlook that one — a cure for him. 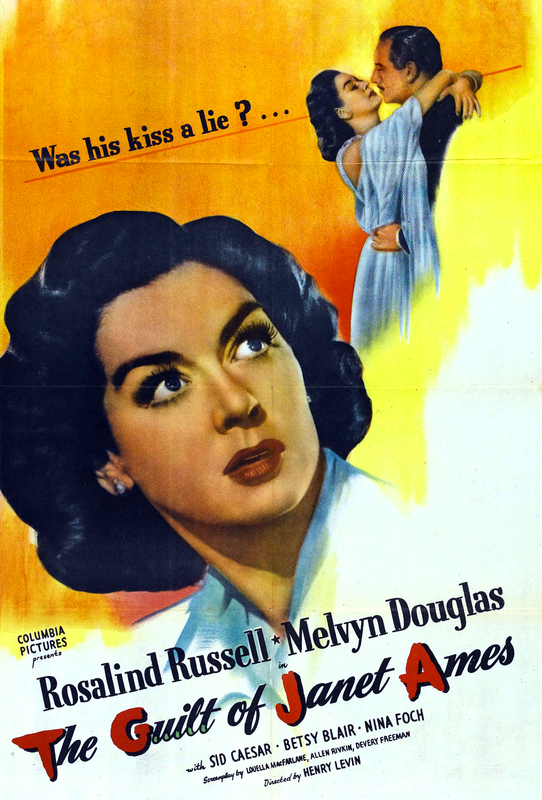 Rosalind Russell’s expression on the poster, by the way, makes it look like a taut thriller. I really don’t know what to think. The Guilt of Janet Ames. I can’t think of a less enticing title for a movie.